Emma Bridgewater revived the forgotten art of sponge decorating when she started her eponymous company twenty five years ago, selling her distinctive hand-printed pottery with its iconic polka dots, hearts and stars. Hugely popular today, spongeware had humble beginnings in the 19th Century when potteries in Glasgow and Staffordshire begun sponging simple coloured shapes onto mass-produced pottery, as an affordable means of creating decorative tableware. Instead of the expensive, labour-intensive art of hand-painting or even ‘spattering’ pottery, decorators found they could achieve an equally pleasing effect using cut sponges to apply colourful patterns. Favourite colours of the time were blue, red, black and various shades of green, although purple and brown were also popular in Scotland.Today many collectors consider these vintage pieces of folk art. 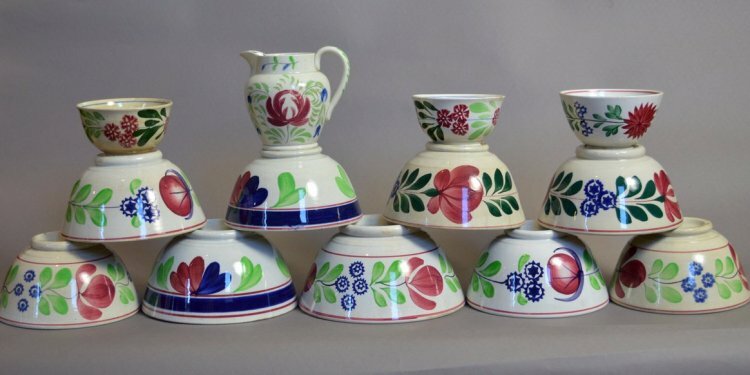 Spongeware gradually fell out of favour until Emma Bridgewater decided to re-launch the pottery factory in Stoke-on-Trent in 1984, after her own early prototypes proved a sell-out in London’s Covent Garden Market. The pottery is still handmade on site and handprinted with sponge patterns (as well as lithographs for more detailed patterns such as Dancing Mice and Snowstorm). It’s a highly complex and intricate art, sometimes requiring several different sponges (Egg & Feather uses 12 sponges) and lots of different colours, all on one piece of pottery. At Chessell Pottery, we offer visitors the unique chance of creating your very own spongeware patterns onto Bridgewater blanks. You can choose your own Half-Pint mug, Plate or Gallon Teapot and decorate it with the traditional technique invented by the Victorians. We also make our own range of Chessellware using sponge patterns that are exclusively cut for us on site by Rachel (see her blog for more details). This is sold in our Gift Barn, alongside the biggest collection of Emma Bridgewater pottery on the Isle of Wight. So whether you want to shop in our Gift Barn, check out the latest offerings from Emma Bridgewater or decorate your own pottery, we look forward to seeing you at Chessell soon!